Since writing my last blog for this site, my life and that of my fictional protagonist Jack Howard have become even more intertwined, and the inspiration for my stories has become even more closely drawn from my real-life experiences. In my novels – the latest, Testament, is the ninth in the series – Jack is an archaeologist working for the International Maritime University, a fictional institute set in his ancestral estate in Cornwall at the south-western tip of England. For Jack, as for me, Cornwall is an elemental place, on the edge of the world, where to stand on the cliffs and to look out to the west is to be drawn beyond the curvature of the earth into a place of the imagination – a place where distant adventure beckons for the modern-day explorer just as it did for the seafarers of the past. As those who have read my novels will know, Jack’s adventures take him to all corners of the earth, but always he remains rooted in his heritage, in the courage and vision of his ancestors who had struck out from these shores over the generations. Always, too, he harbours a dream that his greatest shipwreck discovery might lie not in some remote place thousands of miles away, but in the waters where he had first learned to dive as a boy – a wreck that might transform the history of maritime exploration and knowledge of the first contact with Britain at the time of the Phoenicians. After eight novels I knew that the time was right for Jack to finally make that discovery, at a time when I was beginning to pursue the same dream in my own underwater explorations and had begun to make some amazing real-life discoveries myself, in the same waters that I had imagined Jack exploring in his youth. I first came up with the idea for Jack’s Cornwall heritage when I began going there for holidays with my daughter some fifteen years ago, revisiting places where I’d dived when I was a student some twenty years earlier. Later, I began going to Cornwall to work, finding secluded cottages where I could balance writing and exploring for shipwrecks. Two years ago I made my first major discovery, following clues on old maps and documents to a 17th century cannon wreck. Seeing and touching the cannon for the first time was incredibly exciting, an adrenaline rush that I know fed into my novels at the time, just as my discoveries years earlier on ancient wrecks in the Mediterranean had fuelled my imagination for my first novels. 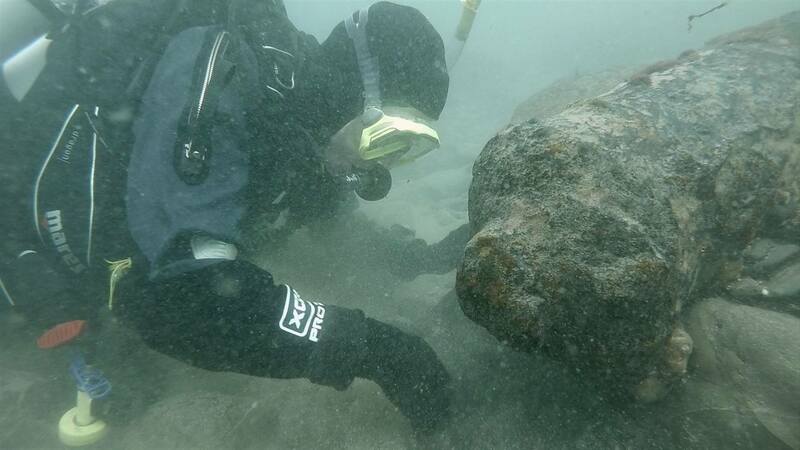 This year I teamed up with local divers and formed Cornwall Maritime Archaeology, a research group mirroring Jack’s International Maritime University. Over the last few months we’ve made more amazing discoveries – one of them, a cannon wreck at exactly the same spot as the shipwreck scene in the recent TV series Poldark, hit the headlines over the past weeks, with our press release and photos of me underwater appearing widely on national news sites and in the dive press. Not only was our wreck at the site of the Poldark wreck – a beguiling fusion of fact and fiction in itself– but it was also in the same cove where I’d imagined Jack and his team finally making their discovery, the shipwreck that forms the centrepiece of Testament. As I stood on the beach being interviewed by the BBC about our own discovery I really did feel that fact and fiction had blurred into a seamless whole, and that I was living one of Jack’s adventures – the same feeling I get as a novelist when I’m transported into the world of my imagination, when I know that the writing is going well and that the storyline is authentic in a way that I could live it in real life. For me, the value of these experiences is not only about touching history, about being able to convey the moment of utter excitement that an archaeological discovery can bring, or about living real-life voyages of exploration, with all of their vagaries, characters and thrills, that give plausibility to my fiction. It’s also about the challenge of using archaeology to reconstruct the past, and about the fine line between the speculation required of an archaeologist and a novelist’s imagination. None of the wrecks that we’ve found are laid out immaculately on the seabed, with all of the artefact plain to see; most are of ships that have wrecked violently against the coast and been buried deeply in sand, their remains visible only as a few artefacts poking above the sediment – a cannon here, a mass of concretion there – seen on one dive but buried again by the next tide. It’s that constantly changing image, that shifting refraction of the past, that most delights me – just when you think you know what’s there, a storm reveals something new that confounds your vision, or leaves the site blanketed in sand and shingle as if there had never been anything there at all. The nagging urge to go back for more, to see what really lies there, makes the wrecks of this coast such powerful fuel for my imagination, just as it pushes Jack to swim out that little bit further and make the astonishing discovery that you can read about in the first chapters of Testament.